Boost « Global Market Insights, Inc.
Pertaining to the growing adoption of renewable energy in tandem with stringent regulations to curb CO2 emissions, the global power optimizer market is likely to traverse alongside a highly remunerative growth graph in the years ahead. Essentially a module-level power electronic (MLPE) device that can efficiently increase a PV solar panel system’s energy output and adjust DC characteristics to maximize energy yield, the product has become a technologically essential component in many residential, commercial and utility-scale solar system designs. By utilizing modules that are integrated with power optimizers, system designers can now reduce the overall power loss from interrupting shade obstructions, thus protecting the systems from long-term module mismatch owing to uneven soiling or debris. Several PV module OEMs are also incorporating this next generation DC performance optimization technique to gain an edge in the power optimizer industry, further pushing the market trends. Power optimizers are increasingly emerging as an ideal substitute for module level power monitoring & management, enhancing the benefits of MPPT with higher operational efficiencies of string inverters. Furthermore, the product’s ability to offer constant, uninterrupted output in a partially shaded environment is anticipated to facilitate its adoption sooner than ever. Indeed, shade on any part of a PV solar panel affects a system’s total output performance. However, with the capability of power optimizers to mitigate the shading losses, users are benefitted with stable output power, irrespective of changing sun exposure. This would serve to majorly expedite the demand for the product across countries such as China, Russia and Iceland, impelling the global power optimizer industry trends. The residential construction sector has been touted to emerge as an invaluable growth hub for power optimizer market. This can aptly be credited to the escalating number of schemes mandated by regional governments – such as incremental energy efficiency grants to support residential roof-top installations. The product has also gained traction in power optimizer industry on account of the rising influx of new, flexible module designs. Say for example in 2018, GreenBrilliance USA, a solar solution provider launched an AI-based solar power optimizer for residential homes called Neurobotz. As per reports, the system’s predictive analytics algorithm generated an optimal load curve and could effectively control the incoming power flow to significantly reduce the amount of electricity consumed in residential zones. Advancements such as the aforementioned are anticipated to pave the way for next-gen solar energy systems, thereby impelling power optimizer market growth. Driven by the robust technological advancements in product design and development and the advantages provided by government subsidies, power optimizer market size from residential applications has been estimated to cross annual installations of more than 10 million units by 2025. Apart from GreenBrilliance, some of the other pivotal players in power optimizer market include SolarEdge, SMA Solar, Altenergy, Ampt, Tigo, Huawei, Kuby Renewable Energy, igrenEnergi, Maxim Integrated, Darfon Electronics, Texas Instruments, Alencon, ABB, Mornsun, Xandex, Ferroamp and Fronious. Companies have been consistently investing in R&D programs and have been looking out to tap the latest technologies to gain an edge in the industry. Last year in September for example, Panasonic Eco Solutions and SolarEdge Technologies launched the HIT S Series Module – an all-new premium smart module, optimized by SolarEdge, for the U.S. residential market. Reportedly, the module is indicative of the integration of the leading solar technology from both Panasonic and SolarEdge in order to accelerate solar module installation and ensure more power delivery to homeowners. Power optimizers are irrefutably essential in almost all PV panel systems to attain ensure stable performance, particularly in partially shaded environments. 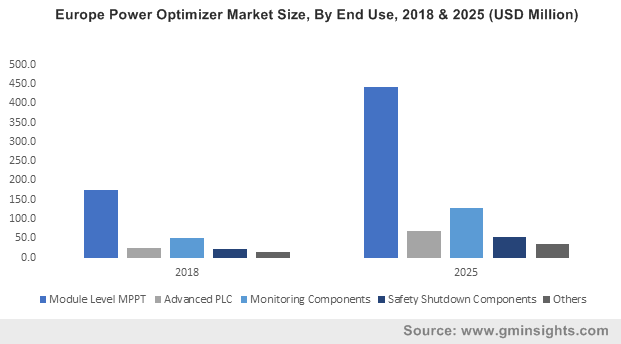 Powered by the product’s robust deployment across the residential, commercial and utility-scale solar designs and escalating technological advancements, power optimizer market size is likely to cross 30 million units in terms of annual installations by 2025. This entry was posted in Sustainable & Smart Technologies and tagged Advanced Power Line Communication, Boost, Buck, Buck-Boost, Commercial, Connectivity, Converter, Global Power Optimizer Market, Module Level MPPT, Monitoring Components, On Grid, Power Optimizer Market, Power Optimizer Market Size, Residential, Safety Shutdown Components, Standalone, Utility.